Cameroon has a total population of 20 million with 60% of the population living in rural areas. Cameroon has an unemployment rate of between 40-50% with 50-55% of the total population living below the poverty line. Cameroonian population live on less then $1.25 making Cameroon one of the most poorest countries in the world today. 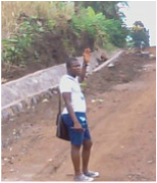 Poor sanitation and lack of good drinking water is a current problem Cameroon faces. Cameroon has abundant natural resources such as petroleum, natural bauxite, iron ore, timber, hydro power, and has rich soil for agriculture including bananas, cocoa, oil palms, rubber, tea, coffee, sugar, tobacco, cotton, groundnuts and rice. GISDECAM is a registered NGO in Cameroon with the vision to be the leading provider of immigration and jobs consultancy through education and knowledge transfer as a means of Nation Building through building people. The strategy is to partner with International Organizations for sustainability and development of the society of Cameroon. "Our mission is to contribute to poverty alleviation through National and international jobs placements and our triple-bottom line of academic placement, tourism and various social travel arrangements. Our international partners and partner institutions ensure the smooth and hitch-free insertion of our clients into their respective domains ranging from training, tourism to jobs, entertainment and various cultural exchange programs. And at no extra cost!"